A team of Harvard scientists are adding mammoth genes to elephant DNA, and they're making serious progress. A team of scientists at Harvard told The Guardian they're getting close to bringing the woolly mammoth back to life, but not in the way you might expect. By splicing mammoth genes for features like long, shaggy hair and cold-adapted blood into Asian elephant DNA, the group hopes to create a hybrid creature similar to the extinct giant mammal. Woolly mammoths disappeared from the planet roughly 4,000 years ago, and their potential return is controversial. While Harvard project leader George Church believes resurrecting the mammoth ensures a future for the endangered Asian elephant and could help fight climate change, others are concerned about draining resources for animals that need help now. 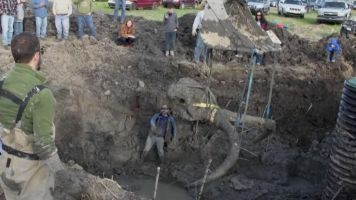 Church admits his team still has two years to go before the "mammophant" embryo is even a reality, and several more years after that until the creatures could roam the earth.